Model C10330-000 Frequency to Voltage Converter Card by Carotron, Inc. is designed to provide a means of converting digital pulse tachometer frequency signals to analog voltage suitable for tachometer feedback control or speed reference in motor control systems. Sine wave signals of 1 to 20 Volts peak at up to 10,000 Hz or square wave signals from 10 to 12 volts peak at up to 20,000 Hz may be used as an input. The frequency signal is optically isolated from the output circuitry so that the signal may be used with digital instrumentation which may be grounded. 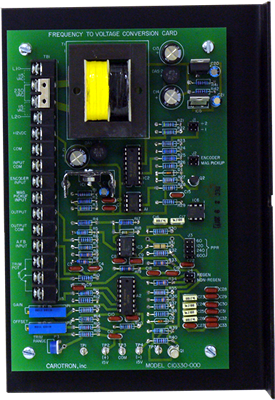 Designed for use with Carotron non-regenerative and regenerative motor controls, Model C10330-000 may also be used with drives from other manufacturers if the feedback can be scaled to work with the nominal 10 VDC output range. For regenerative operation, a buffered armature voltage signal scaled for approximately 10 VDC at maximum armature voltage must be supplied for the polarity switching circuit. This voltage must be positive with respect to circuit common when the drive requires positive tach feedback and negative when the drive requires negative tach feedback. An isolated +12 VDC power supply rated at 100mA maximum is provided to supply encoders or magneto-resistor sensors. Input ranges of 60, 120, 240 and 600 pulses per revolution on 1750 base speed motors provide a nominal out put range of 0 to 10 VDC. Multi-turn potentiometers for OFFSET and GAIN allow precise adjustment for the desired output. For systems where the output voltage is to be used as a speed reference, terminals are supplied for an optional external TRIM pot. for either manual or dancer control. A single turn TRIM RANGE pot. is supplied on the C10330-000 unit to limit the range of the external TRIM pot. *Note: Carotron has released a new Din-Rail mountable Frequency to Voltage Module (Model FTV220-000), which can be used for new or existing applications.